Apple’s launch of the Apple iPhone 5 has caused a stir on both Twitter and Facebook in the last week. Using YouGov SoMA, you can see that mentions of “iPhone” on the private newsfeeds of a 13,000 Facebook user sample spiked on both the day of the iPhone 5 announcement (12 September) and the day of the actual release in stores (21 September). The announcement saw mentions of the iPhone increase by seven times from the previous day and saw frequent words include: “new”, “apple”, “out”, “today” and “looks”. Mentions of the iPhone then appeared to drop to their lowest on 15th September before gradually increasing to their highest point on Friday – the day of the release. Most frequent competitors mentioned since 11th September together with iPhone include “Samsung”, “galaxy”, “orange”. Mentions of “Samsung” were heard 4 times more than those of “blackberry” - when used together with mentions of “iPhone”. 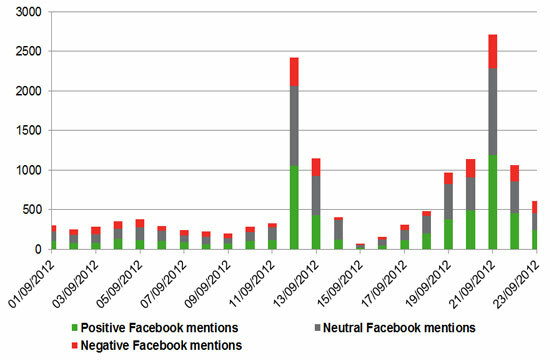 Between 11 and 23 September, these two Facebook pages did more than any other to increase mentions of the iPhone 5 on a large population of Facebook users’ private feeds. When comparing Facebook to Twitter, Twitter users heard more about the iPhone on the day of the announcement than on the release of the phone in store whereas Facebook users saw the opposite. When comparing the number of mentions heard by a representative sample of Twitter users (10,000 strong) to the mentions heard by a representative sample of Facebook users (13,000) – numbers increased on Facebook by 10%, whilst falling on Twitter by over 50%. 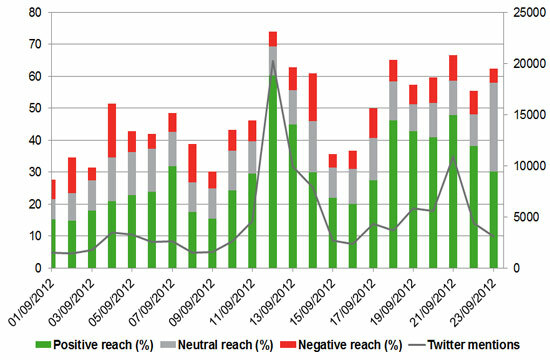 Using SoMA’s unique reach score which allows us to estimate the proportion of Twitter users who heard mention of the iPhone at least once, we can see that on Twitter the iPhone has a wider audience in the UK on the day of the announcement than on the day of the release of the phone in stores. On 12 September, 60% of the UK Twitter audience would have received at least one tweet about the iPhone in their newsfeeds. On 21 September, this reach score fell by 12points, to 48%. Between the 11th September and 23 September, 88% of the UK Twitter population had the opportunity to hear about the iPhone via their Twitter feed at least once. Using the scores for the announcement and the release day, it is clear that a high proportion of individuals on Twitter heard more than one mention during this period. Significantly, the iPad also achieved above 80% reach over the same period as the iPhone. Of those who heard about the iPhone on Twitter, 62% were male and nearly half (48%) were under the age of 34 and nearly half (49%) have a household income of above £30,000. Exactly half have either a Virgin Media (19%) or a Sky Digital (31%) TV package. When comparing these Twitter audience statistics to those of Samsung Galaxy, it is possible to see that mentions of the iPhone has a slightly more male audience on Twitter than mentions of “Samsung Galaxy” but in all other areas – the two brands are sharing the same audience demographics. 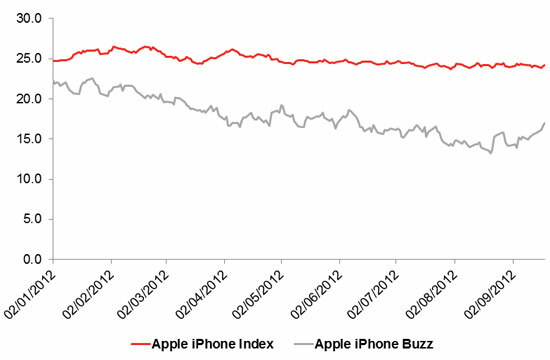 When looking to YouGov’s daily brand tracker – BrandIndex – the iPhone appears to have lost significant Buzz (by some 8 points) by the end of August – but has since regained 3 points. In overall perception (Index) iPhone started this year at around 25 points – a score which following the announcement of the iPhone 5 had just a point difference. It will be interesting to see if the increase in positive reach surrounding the iPhone on social media will drive up Buzz levels and perception in the eye of the general public in weeks to come.